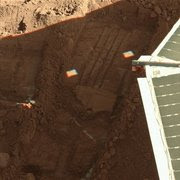 If you haven't heard already, NASA's Phoenix Mars Lander has detected snow falling from Martian Clouds. Unfortunately Phoenix never got to test its robotic arm snowman building abilities; the snow vaporized before it could reach the ground. Two minerals were also discovered in soil samples scooped up by Phoenix, calcium carbonate (the stuff chalk is made out of) and clays. The findings are importance because liquid water is needed to create both substances, suggesting that the red planet was once capable of sustaining life. 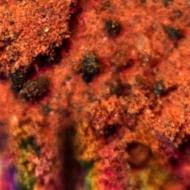 Phoenix's on-board instruments, the Thermal and Evolved Gas Analyzer (TEGA) and the Microscopy, Electrochemistry and Conductivity Analyzer (MECA) were used to identify the minerals. The high-temperature release of carbon dioxide from the soil sample was matched by TEGA to a temperature known to decompose calcium carbonate and release carbon dioxide gas. Calcium carbonate acts as a natural buffer, and a solution buffered by calcium carbonate contains a specific concentration of calcium. MECA provided additional evidence by determining that the measured concentration of calcium matched exactly with expected values. Evidence from a TEGA oven, specifically the high temperatures required to release water vapor from the clay soil indicate that the clays may be phyllosilicates, sheet-like structures very common on earth. Phoenix is already working over time. NASA stretched the originally three month mission to the end of this year, if the spacecraft can handle it. The coming fall and winter months mean less sunlight, and so less power for its solar panels. In addition, communications between Phoenix and NASA ground control will be blocked briefly in November, when the sun is between Earth and Mars.